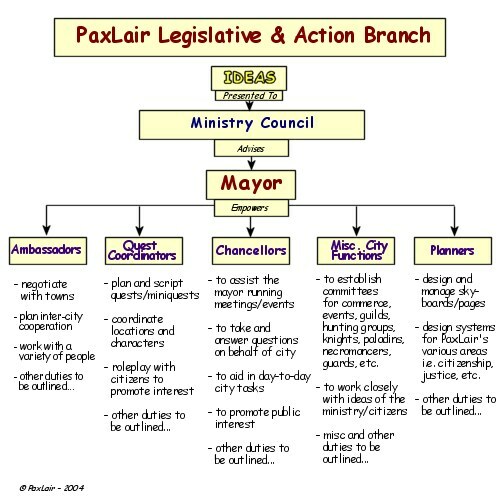 The PaxLair Government is not static in its design and application. It changes as the PaxLair Community changes. All comments are welcome at any time regarding the government structure. For historical and reference purposes, earlier government charts and descriptions are also provided. Distinction is made in the following regarding ACCOUNTABILITY and RESPONSIBILITY. "Accountability is the 'ability to be brought to a count'. In other words, your work is checked and verified that it has been completed well, accurately and in accordance to the goal that was set." "Responsibility is the 'ability to respond'. Simple really. For you to do the job, you are assigned, you simply need an ability to do it. Whether you do it well, or not, is another matter." One can delegate responsibility, but never accountability. "If someone gives you a job to do, you can get someone else to do it [delegation of responsibility], but you are still accountable to produce the results. If the job isnÃ¢â‚¬â„¢t done right the only person to blame is you, because even though youÃ¢â‚¬â„¢ve delegated the responsibility, you are still accountable." Since the Governor [a role-played character] is the PaxLair Statehood and Alliance leader, he is ACCOUNTABLE for the PaxLair Statehood and Alliance. His accountability is to the "Caretaker of PaxLair [a real person]". The standards for the Governor's accountability are the PaxLair [in-game] tenets of Peace, Neutrality, and Role-playing. The Governor is also RESPONSIBLE for sound [in-character] leadership within the PaxLair Community and Alliance. He sets standards and delegates responsibilities to Mayors of PaxLair cities and Alliance guildleaders. 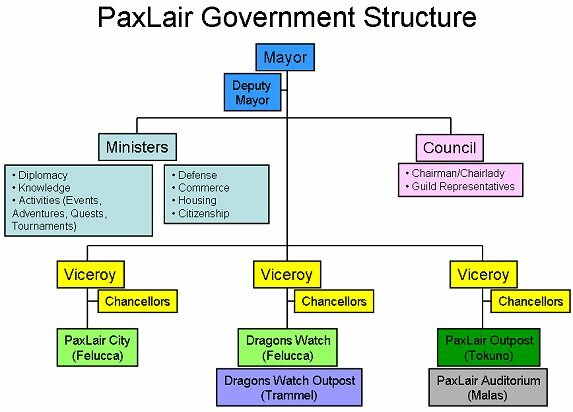 Mayors of PaxLair cities and Alliance guildleaders are accountable to the Governor for their cities and guilds, meaning they are accountable for the outcome of their decisions made solely for their cities or guilds in the alliance. They are also responsible for sound leadership and cooperation. The Governor will become directly involved in Mayors' and Alliance guildmasters' situations that may lead to precedent or an accountable outcome or result for the entire PaxLair Statehood and Alliance. With respect to the PaxLair Alliance and Alliance guilds, the Governor is the sole authority for Alliance-wide decisions, including accepting or removing guilds from the Alliance. 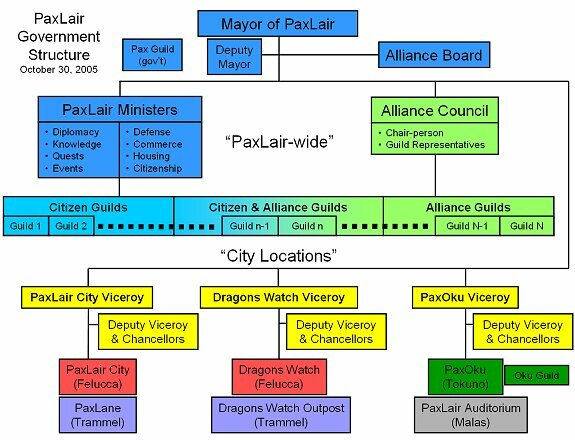 All Alliance guilds are sponsored by a PaxLair city Mayor or the Governor. Alliance guildmasters are accountable for their decisions as an Alliance guildmaster with respect to being part of the Alliance. They are not accountable for the results of actions or decisions by their members unless they choose to take such accountability. Alliance guildmasters are responsible for their guildmates' understanding of the purpose, expectations, and laws/decrees of the PaxLair Statehood while in the PaxLair Alliance. Alliance guildmasters are responsible to make sound decisions in-good-faith regarding their guildmates' actions (good or bad) that affect the Alliance. If there is ever an unresolveable conflict between loyalty to the Alliance versus the Guild, guildmasters may of course declare loyalty first to their Guild, even to the extent of resigning their guild from the Alliance at any time -- Except in the case of a PaxLair city's primary citizen guilds, which are an official part of the PaxLair Statehood, e.g. PaxLair City - PaxF, Dragons Watch - DWxC, and PaxOku - PaxO. 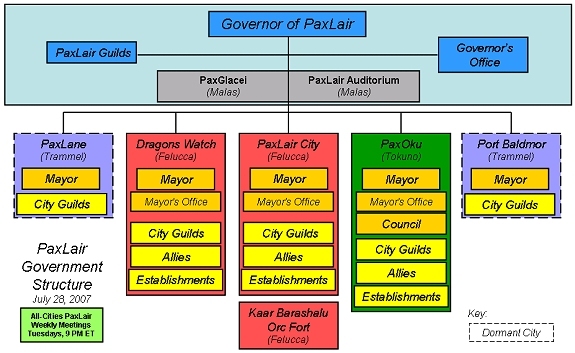 Also, the PaxLair Statehood Guild - Pax is controlled by the Governor or PaxLair Caretaker. Alliance guildmasters are expected to bring to the Governor's attention any situation that may involve setting a precedent for the entire Alliance. Precedences are not law, but may be considered guidance for future Alliance-level decisions. PaxLair has long had relationships with other towns and cities in the Realm. Some have become Sister-Cities where many activities were done together, citizens and citizen-guilds co-mingled and became good friends, and the Mayors work together to advance each city in various ways. At times, even information services were cross-connected to each other in obvious ways to allow the ethereal traveler to quickly learn about the sister cities. Many times, the traveler would then decide which city was most interesting for his or her goals and ambitions. PaxLair is seeking to re-establish the concept of Sister Cities once again in the 8th year of the Realm. The Sister Cities' Mayors can form a type of Roundtable where no mayor has any authority over another and all discussions and any mutual decisions are based on cooperation. Individual decisions are always left to each Mayor for their own city. This structure brings back a solid focus on the existence and roles of PaxLair Cities and Towns. With the addition of Port Baldmor to the PaxLair Community, the Mayor felt it was time to refine and clarify the government structure. 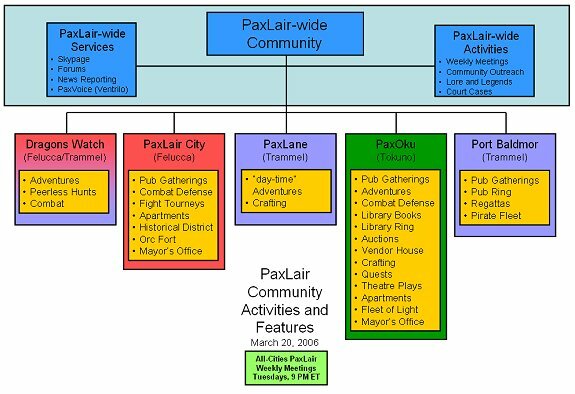 The City/Town environments will once again become the central focus of PaxLair Community at large. The purpose of this refined structure is first to give more responsibility, accountability, and authority to Viceroys of the Cities and Towns. 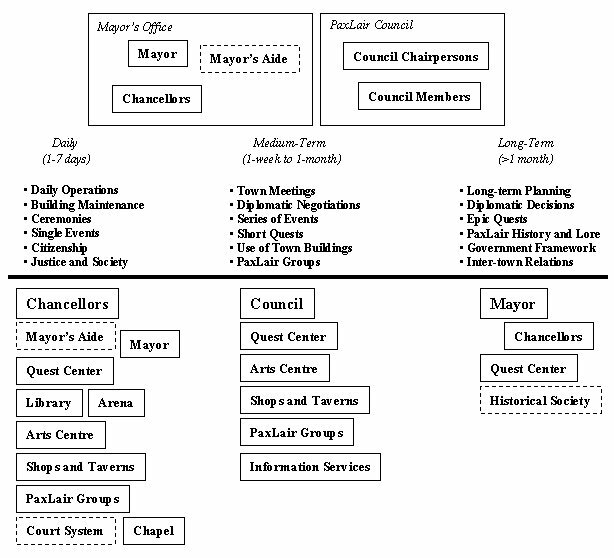 Each Viceroy will maintain good contact with the Mayor and also the guilds of his or her City/Town. The Viceroy defines the activities and characteristics of the City/Town. Guilds are generally residents of a particular City/Town. All Cities/Towns then work together for common PaxLair Community goals, events, and involvement. 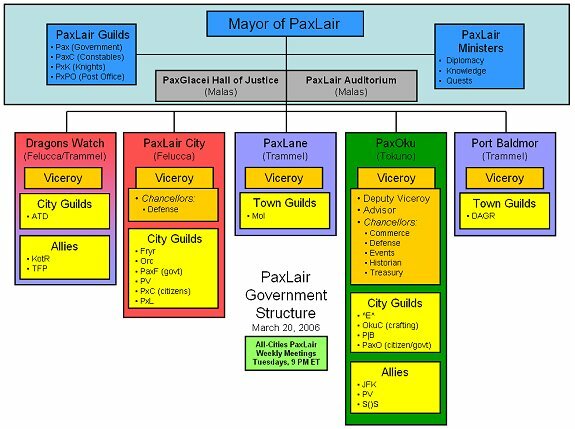 This PaxLair Government structure was used during a time when many non-resident guilds joined PaxLair in a large alliance. PaxLair Cities and Towns were being built or rebuilt. This structure served PaxLair well for about six months. As of Jan 29, 2005, Mayor Winfield is working on a comprehensive Government Structure to allow as much opportunity for people as possible. Below are charts from the current design in discussion and older designs and proposals. If you have comments on the Government Design, post them on the PaxLair Forum.